My Country, Wallpaper GREEN is a translation of a painting by Lilly Kemarre Morton, depicting the Australian outback: bush tucker & bush medicine plentiful after the rains. Notice the sugar bag tree, rendered here in yellow by Lilly – a natural bee sweetener found in tree hollows, it is a favoured motif of hers. Lilly's husband is the legendary Banjo Petyarre Morton, who led the historical Aboriginal stockmen walk-offs of 1949, successfully winning the fundamental right to earn wages instead of rations. Bay Gallery Home's My Country Wallpaper, GREEN. Lilly's landscapes beautifully communicate the rich knowledge she possesses of both medicinal plants and country, the heart of her culture. As a young girl, Lilly lived traditionally off of the land with her family and Alyawarr people. In Lilly's lifetime, she has experienced and borne witness to the irreversible changes of country and way of life, previously unchanged for thousands of years. She is now a kind and gentle elder of the community, and often tells her family and friends stories of how life used to be in Alywarre, her language. These stories are also a great inspiration for many of the artists within the community. 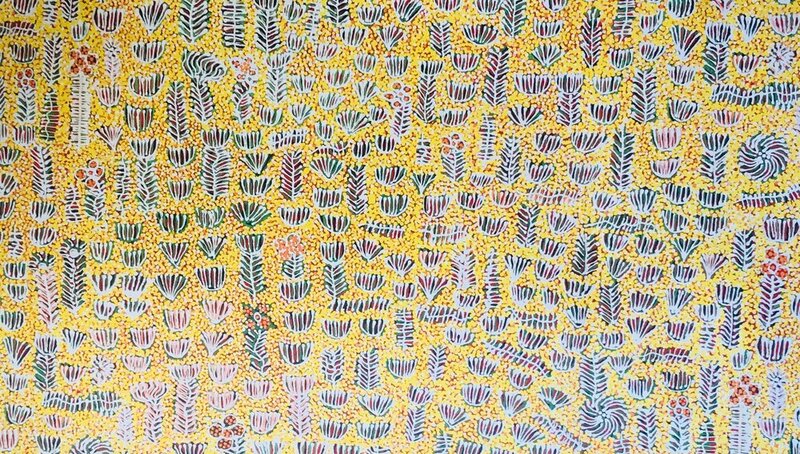 Lilly is passionate about nature, especially her country and the plants that grow on it, and though she has little English, she is ever keen to explain the various bush medicines which she depicts in her paintings.